In Scotland there has been a long held tradition of herbal folk medicine. However, written accounts of commonly used remedies did not appear until very much more recent times, knowledge of plants having been initially passed from generation to generation by word of mouth. Particularly in the more remote areas of Scotland, folk medicine was handed down by tradition, with little change, until the 17th Century. Opportunities for medical education were limited, and means of transport extremely bad, making it difficult for medical practitioners to reach patients out with the principal towns. As a result many had to rely to a great extent upon remedies which were available locally. Many herbals, particularly those belonging to Scottish land-owning families, were very decorative, typically leather bound and often interspersed with ornately decorated pages with drawings and elaborate hand-writing. Individual volumes were often written in different hands with recipes and remedies occasionally being attributed to individuals. Indeed a particular 18th century volume (in the National Library of Scotland) entitled ‘Physick and Cookery of various Kinds’ compiled by Martha Bruce, Countess of Elgin, contains contributions from eminent individuals including Dr Herman Boerhaave’s cure for Chilblains and Asthma and remedies from Dr Ratcliffe, Physician to Queen Anne. 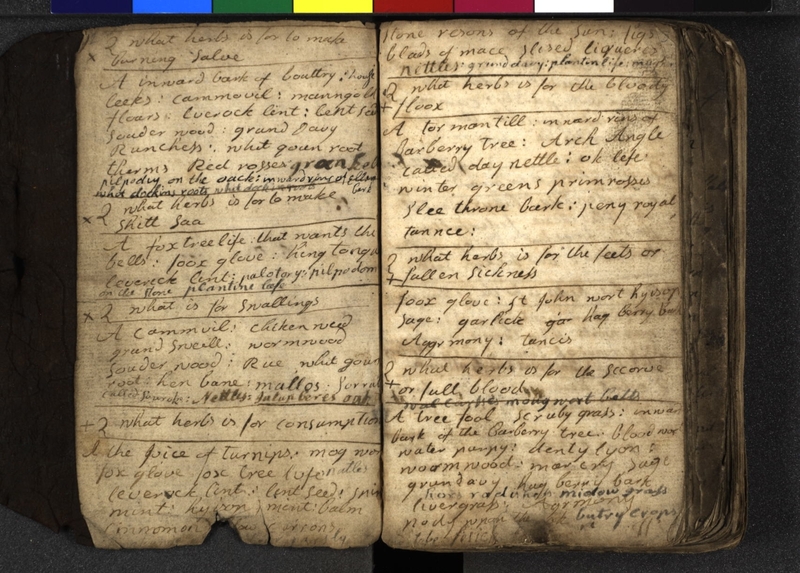 Herbals often contained not only herbal remedies but also recipes and beauty and household remedies, and in later years, the traditional household herbal came to resemble more of a cookery book with sections for herbal remedies being relegated to the back of the volume. The remedies and recipes often remained unchanged with the same herbs and methods being used for centuries. This particular volume is only a small illustration of the abundance of similar material which can be found in public and private collections of household papers, and provides a small insight into the strong tradition of herbal medicine which has existed in Scotland down the ages. 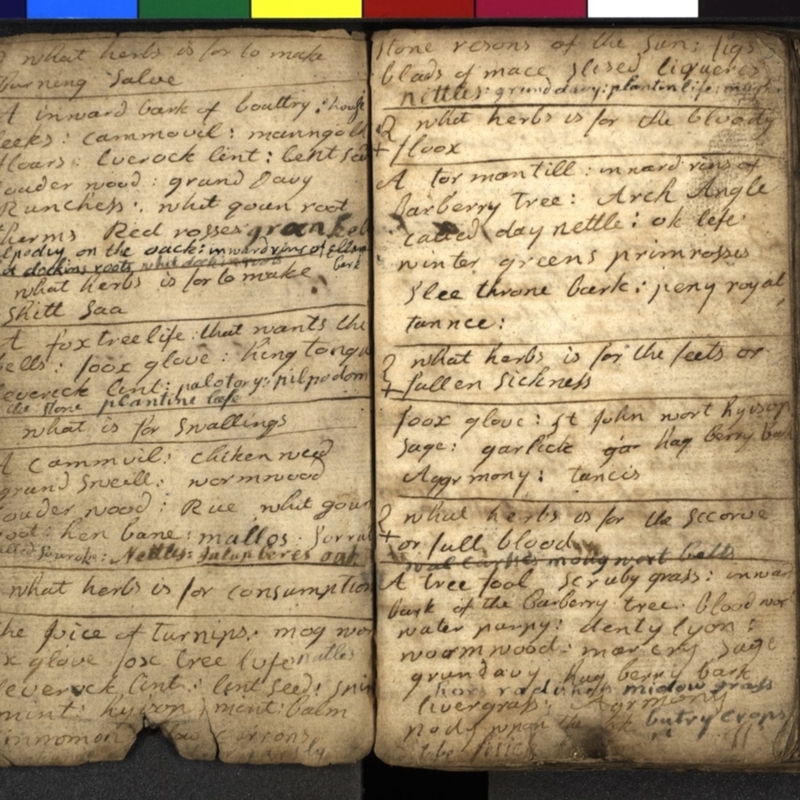 “18th century book of herbal remedies,” Heritage, accessed April 23, 2019, https://heritage.rcpsg.ac.uk/items/show/187.